Seattle, 1999 , 3rd edition. 248 pp, 113 color photos, maps. New large format hardcover with dust jacket. This is a heavy, large format book. Extra postage will be requested for International Mail and Priority Mail. Messner's ascents of the 14 - 8,000-meter peaks, without oxygen and many solo, is the greatest mountaineering feat of all time. In addition to the stories, this book is a reference for the history and routes of the 8000 meter peaks. 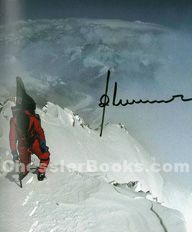 In addition to the stories, this book is a reference for the 8000 meter peaks. Reinhold Messner is recognized as one of the greatest mountaineers of all time. When he reached the 8511-meter summit of Lhotse in Nepal, he became the first man to stand on all 14 of the world's 8000-meter peaks-an unbelievable achievement and a sensation in mountaineering history. What motivated Messner to be so dedicated in pursuit of his goal, despite unbelievable hardships, to keep confronting danger and death, loneliness and self-doubt? What thoughts and feeling occupied him when faced with his inner self and the highest mountains of the world? The answers to these questions can be found in this revealing memoir. Through engaging text and full-color and black-and-white photos, readers will get a glimpse of the preparation, organization, and running of an expedition, and share rare moments on the summits of the world's highest peaks. This updated edition also includes Messner's comments on Jon Krakauer's Into Thin Air.